Ekphrasis or ecphrasis is the graphic, often dramatic, description of a visual work of art. In ancient times it referred to a description of any thing, person, or experience. The word comes from the Greek ek and phrasis, ‘out’ and ‘speak’ respectively, verb ekphrazein, to proclaim or call an inanimate object by name. Nowadays it might be a snapshot of a scene, a work of art, or any creation that puts you in the head of the participants or an object and tell’s you what is actually happening within it. So I thought, why not pick one of my collages as a prompt and write about it? My writing and my art are so entwined that it is hard sometimes to separate them. 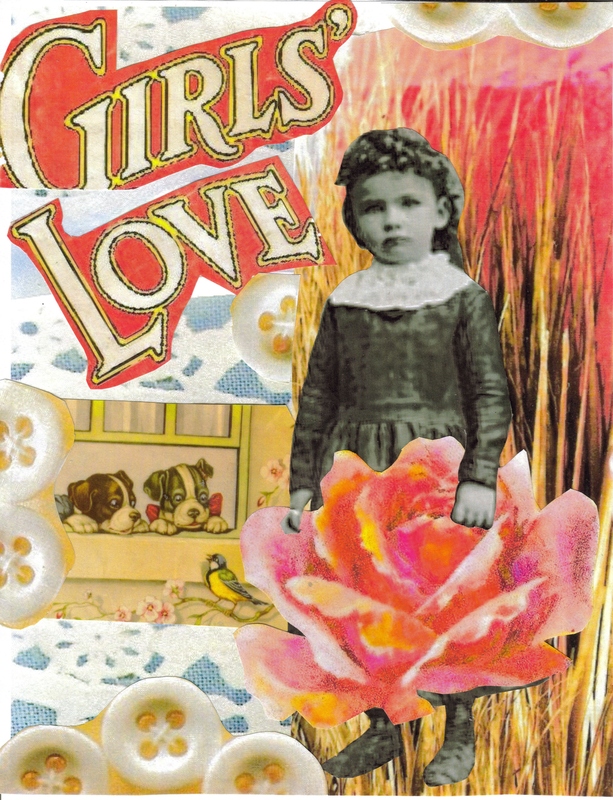 As with writing, I’ve been collaging since I was a child. Collage is an old art form, revived in the 20th century as modern art, consisting of portions of other works of art, text, purchased or handmade papers, embellishments or found objects glued to a background to make a new work of art. I think of the process of creating a collage, or a poem, or any form of writing as largely intuitive and subconscious. It is in the reworking of the raw material that the new form is created. For example, when I collage I may have a general idea of what I want to create, so I go through my boxes of clippings and images, pulling out anything that supports the idea and seems somehow to go together, or just strikes my fancy at the time. I select my surface and get my materials together- scissors, glue, anything I want to add to the work like ribbons or coins or what have you. Then I start cutting out the images or text I like, seeing how they might go together. This influences the background I create, as there may be colors or a pattern I am especially drawn to in connection with the images. I make the background, then select and place the items I have selected, switching them around, cutting some to combine two images into a cohesive unit. When I am satisfied, I start gluing them down. Sometimes I have to partially lift one image to place another behind it to add depth; sometimes I remove an image that just isn’t working. The process is much like editing a piece of writing, cutting and rewriting and rearranging until it works. I’m especially drawn to an intuitive process called Soul Collage, where 5 x 8 cards are created on mat board. It’s done entirely intuitively, usually without even a starting idea, just pulling what images appeal to me. 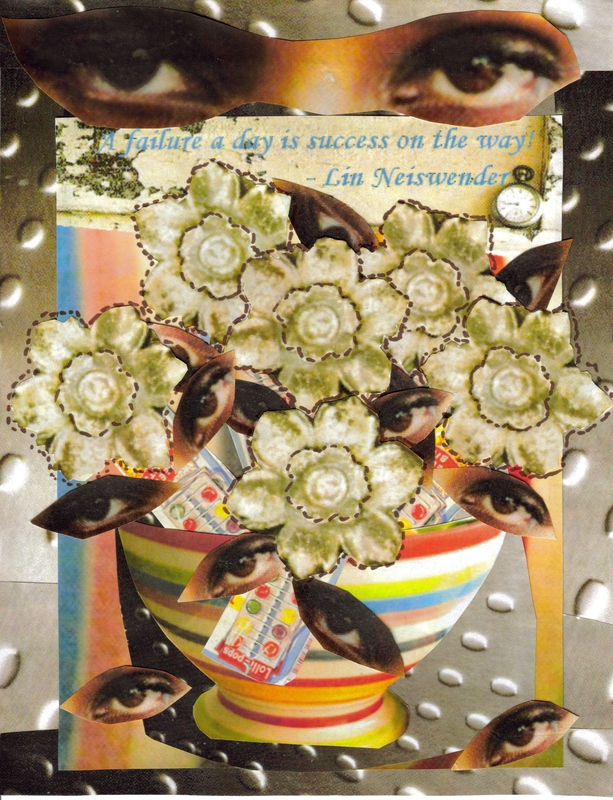 This form of collage does not use text at all, leaving the interpretation of the card up to the viewer. The card’s creator asks and answers a series of questions about the card and it can provide some amazing insights into one’s psyche. To me, that is a collage’s magic, the personal interpretation. When I made the collage that appears on the cover of the Lifelines book- long before the book was ever thought of- I was looking into the ocean of ideas for inspiration in many areas of my life, seeking the mermaid for answers. “Express!” is the only word in the collage, and that, I think, is the essence of the creative experience: express yourself, reveal yourself, and find your truth.